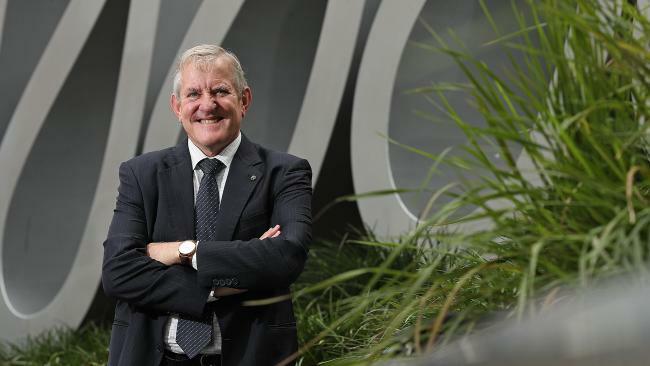 Queensland Resources Council head Ian Macfarlane says Aurizon should stop playing politics. AURIZON is brazenly trying to break the agreed process of regulation through an "old style industrial campaign in which the public bears the brunt'', according to the mining industry. The rail and logistics company has been forced into a corner by attacks from the sector after it adopted changes to its central Queensland coal network maintenance schedule that could wipe $4 billion from coal exports because fewer coal trains could use the track. The changes followed a Queensland Competition Authority draft ruling determining how much Aurizon could earn from the network. The QCA came up with a figure that was $1 billion less that Aurizon's submission and it has implemented the cost-saving maintenance changes over concerns the final ruling will be retrospective to July last year. But Queensland Resources Council chief executive Ian Macfarlane said rather than accept the decision was only a draft Aurizon chief executive Andrew Harding had "taken the inexplicable decision to insist the his railway can't be efficient and instead damage his customers' business''. "Remember, when the former Bligh Government privatised QR and formed Aurizon, it was clearly understood by Aurizon that its charges would be overseen by QCA,'' Mr Macfarlane said. "Aurizon itself estimates its decision will halt the movement of up to 20 million tonnes of coal a year, the equivalent of up to $4 billion in exports and up to $500 million in royalties paid to the Palaszczuk Government to reinvest in services and infrastructure on behalf of all Queenslanders. The company said the QRC was doing its members a disservice by continuing to grandstand on the issue. "As a peak industry body the QRC efforts should be focused on working together with industry on a solution,'' the company said. "We have clearly explained to the QRC why our actions are necessary. "They know that if we didn't implement these changes to align to the QCA draft decision it could potentially cost the company hundreds of millions of dollars due to the retrospective nature of the process."